Approx. 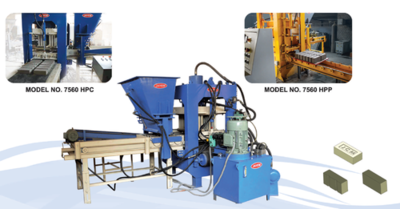 Price: Rs.1000000 / Unit Product Details: Minimum Order Quantity	1 Unit Capacity (bricks per hour)	2500-3000, 2000-2500, 500-1000, 1000-1500, 1500-2000 Method	Hydraulic Pressure Tolerance	1 mm, 1.5 mm, 2 mm Working Pressure	Upto 2600 psi Weight	7500 kgs Bricks Per Stroke	14-16 pcs. This Automatic Hydraulic Press for Fly Ash Bricks has been designed especially for fly-ash bricks. The casting of bricks is not done on pallets, but, directly on a rubber belt which conveys the brick to be hand picked and stacked on the manual hydraulic pallet truck, therefore the hassle of pallets is eliminated. It is a P.L.C. Controlled machine making it easier to use and efficient for high production. This Automatic Hydraulic Press for Fly Ash Bricks has along with Roller Pan Mixer, Conveyor belt, and Manual Hydraulic Carts. Features : The number of bricks can be as high as and of standard size without frog mark. The Hydraulics and P.L.C. used in this equipment are of very high quality and standard. This has the capacity to take high pressure.